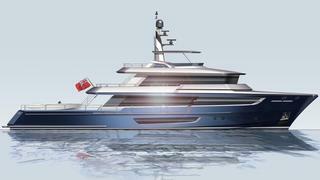 Van der Valk has revealed a new 38 metre explorer yacht concept, the first from its Continental Five range. The Continental Five is the fifth series in the Van der Valk range of semi-custom motor yachts and has been developed in partnership with Guido de Groot. The Dutch yard has had notable success with the first four distinctive series and now looks to expand its range as the global demand for explorer yachts increases. The Continental Five is designed to manage extreme weather conditions and will have a transatlantic range – enabling it to travel to those more out of the way destinations. The new model is offered with a range of exterior designs across the triple-deck configuration. This flexibility allows owners to choose the features that are most important to them. For example the wide aft deck is designed to accommodate two tenders and water toys or a helicopter deck or a swimming pool. The standard arrangement sun deck has a wet bar, lounge seating and a large sunbed. The large outside area on the bridge deck can be used as an alfresco lounge or dining space. The main deck interior features a large saloon with floor-to ceiling glass as well as a spacious master suite forward. A VIP and two further guest cabins on the lower deck provide accommodation for up to eight guests while three crew cabins provide space for five or six crew. Owners can also choose from two different construction methods: either a full displacement version with steel hull and aluminium superstructure or a fast displacement hull built completely from aluminium. Twin CAT C18 Acert diesel engines will provide the necessary power to reach an estimated top speed of 14.2 knots.